Prize-winning journalist Freedman reconstructs his mother's biography. Freedman's mother died of breast cancer more than a quarter of a century ago--indeed, his stepmother has been a part of his life longer than his mother was. And now, in middle age, he decided to learn what he could about Eleanor Hatkin Freedman, her life before marriage and motherhood. The result is terrifically intimate: a son growing up in Jewish New York at mid-century, and a son, decades later, coming into his grief through a process of research. 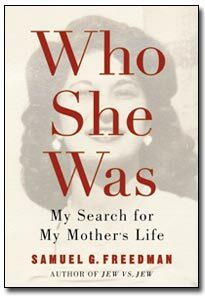 The account of Eleanor's mother's efforts to get her relatives out of Nazi Europe is heroic, harrowing, and heartbreaking--though not intimate to the point of myopia. There's also American history here, as when Freedman explains about Eleanor's following the model of Rosie the Riveter, or about the pre-rationing runs on stores. And there's the transfixing undercurrent of soap opera. Freedman's mother fell in love with a gentile and would have married him had her own mother not reacted histrionically. Instead, she hastily married a good Jewish boy, only to have that marriage annulled not long after the chuppah. Her subsequent courtship with Freedman's father is summarized in a few paragraphs, and the entirety of Eleanor's second marriage is skipped--until the chapter about her death. This large omission, surprisingly, works. You get no sense of being cheated of mother-and-wife, since Freedman (Columbia Univ./Jew vs. Jew, 2000, etc.) has so clearly established that his purpose has been to uncover an earlier Eleanor, an earlier era. Nor should anyone skip the concluding note on sources. There, Freedman throws down a gauntlet: he is concerned, he says, by the trend in memoir and family history to blur fact and fiction, to invent what you can't remember. His reconstruction, he insists, is history, and as factually accurate, and historiographically informed, as possible. A son's story, a Jewish story, an American story.